Buckland House Academy was built and opened as a day school in 1847 by James Bailey Bassett and his wife Ann (who died soon after in 1851). It was the first school in Willunga and, until 1853, the only school. It was also the Bassett family home. From late 1852, Buckland House also accepted boarding pupils for 24 Guineas a year including school materials and washing, as well as providing one place for a half boarder aged 12 years or more. Enrolments increased - in 1853 James Bassett was teaching 54 boys and his second wife Mary was teaching 34 girls. 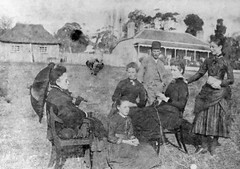 Other schools opened in Willunga but the Bassetts continued educating children at Buckland House with 42 boys and 34 girls enrolled in 1857. In December 1859 James and Mary Bassett's stipends from the Central Board of Education were set at £70 and £50 respectively. With the opening in 1862 of the Bassett Boys' Schoolroom next door, Mary Bassett continued to teach girls at Buckland House while James taught the boys in the new Schoolroom. Annual examinations were conducted, with glowing reports from the Chief Inspector of Schools, Dr Wyatt, who remarked in 1870 that the two schools were second to none under his inspection and he hoped that Mr and Mrs Bassett might long continue in their sphere of usefulness. Following James Bassett's death in 1875, and the closure of the Bassett Boys Schoolroom, Mary immediately advertised her intention to provide select education for young ladies at Willunga at her Private School, with a limited number of boarders and day scholars (SA Register 18th March 1975). While Mary was unable to regain a school-teachers license from the Central Board of Education, Mrs Bassett's school continued for some years with assistance from Mary's nieces Charlotte and Edith Nesbit. Miss Ella Hawkins also assisted. The school closed with the death of Mary Bassett in 1889, aged 69 years and Buckland House became a private residence. Do you remember Buckland House Academy 21 St Lukes Street ? Then Join up and add your memory here.